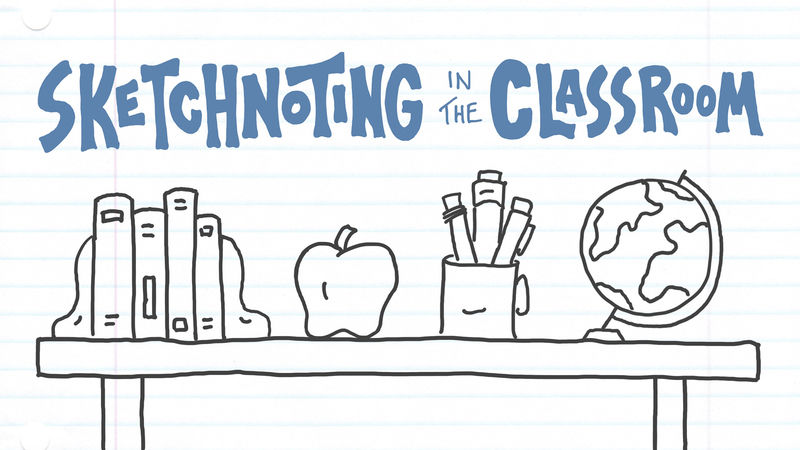 If you’re a teacher interested in sharing the skill of sketchnoting with your students but you’re not sure where to start, here’s a small and manageable way to weave visual note-taking into your classroom activities. Start by setting aside a chunk of board or wall space. 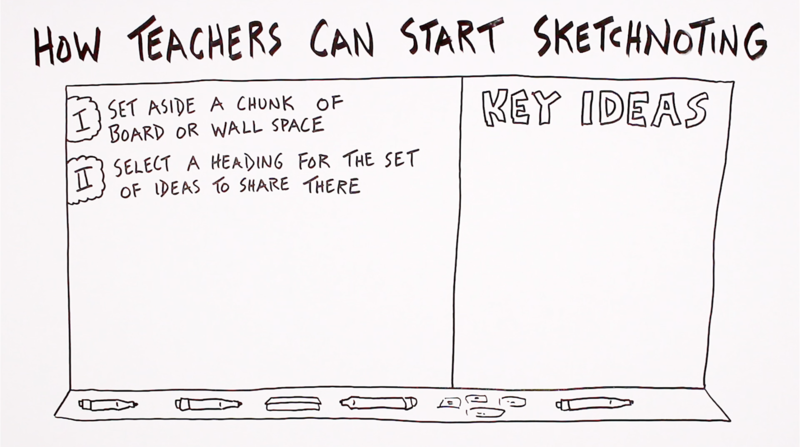 This will be a dedicated spot in your classroom to highlight some important ideas, using sketchnoting to do so. 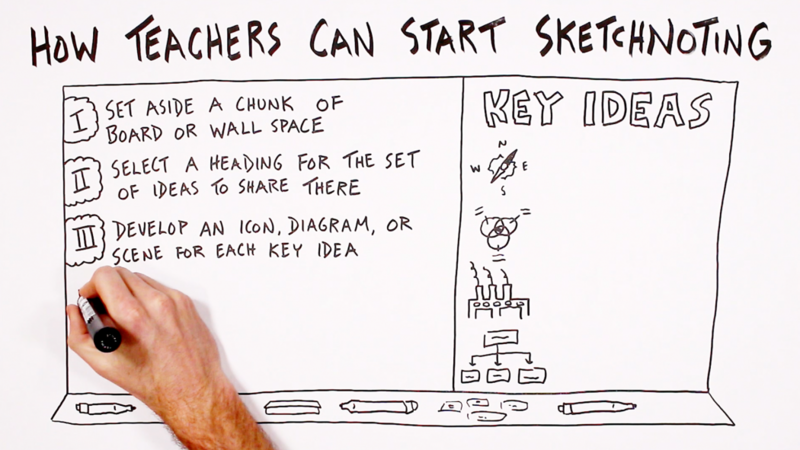 Start by setting aside some wall space and deciding what set of ideas you’d like to share there. Once you’ve set aside that space, select a heading for the set of ideas that you’d like to share there. You could choose to share the key ideas of the current unit, maybe some new vocabulary, or even the core principles of your discipline–the concepts that you want to hit home throughout the entire term or year. Below that heading will be a space for you to sketchnote out those ideas, maybe one new idea a day (might be a good warmup activity) or one new idea a week, depending on the role that you’d like this dedicated sketchnoting space to play. For the visual associated with each idea, feel free to keep it simple. Try to come up with an icon, a diagram, or a scene for each idea. This is a place for you to demonstrate different types of visual representations that students might start using within their notes. For each idea you add, start by depicting it with a visual such as an icon, diagram, or scene. Those images can have a range of complexity. The examples I’ve share here are a compass, a Venn diagram, a factory, and a flowchart. Alongside each of those visuals, include a single-sentence text description. With that combination, you’ll have the visual as a shorthand reference to the ideas, and then within the text is where the details live. Add a text description to complement and add depth to the visual. 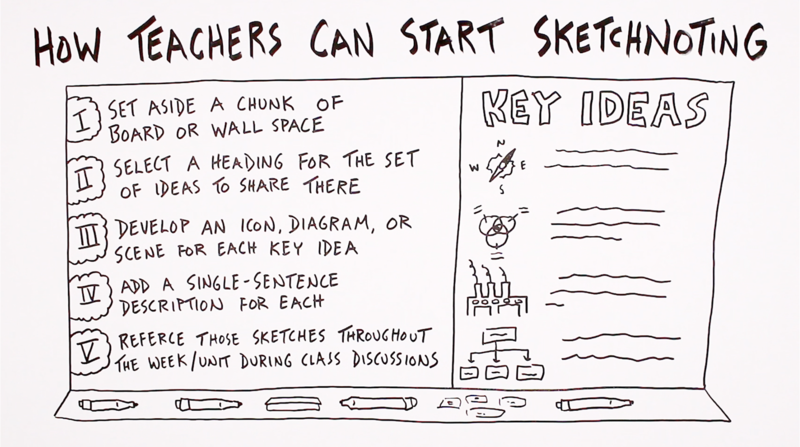 You’re now all set for those sketchnotes to be a reference during class discussions. In that way, this dedicated space for visualized ideas can become part of the conversations that you’re having from day to day. That type of integration can help your students internalize those ideas and think about them in more complex ways because of how they’re applying them over time. As you move from one week to the next or one unit to the next, you can snap a photo before erasing the board and starting the next set of ideas. Or, if you’re using a large flip chart, pull off that sheet and store it for now, but know that you can bring it back up for review later on. 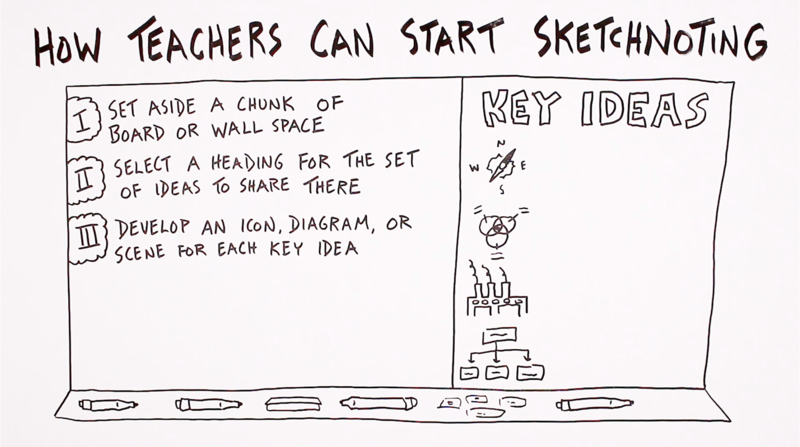 Once students have seen the way in which those simple sketches help them remember ideas, they’re primed to start creating them on their own, within the notes that they take for this class or for others. I’ve heard from some teachers that after connecting core ideas to simple visuals, they’ll often see those visuals show up in the margins of tests or essays. It’s that type of transfer of this core skill of sketchnoting that you might be able to kickstart with this simple approach. So I encourage you to give it a try in your classroom, and of course feel free to tweak it however you see fit. 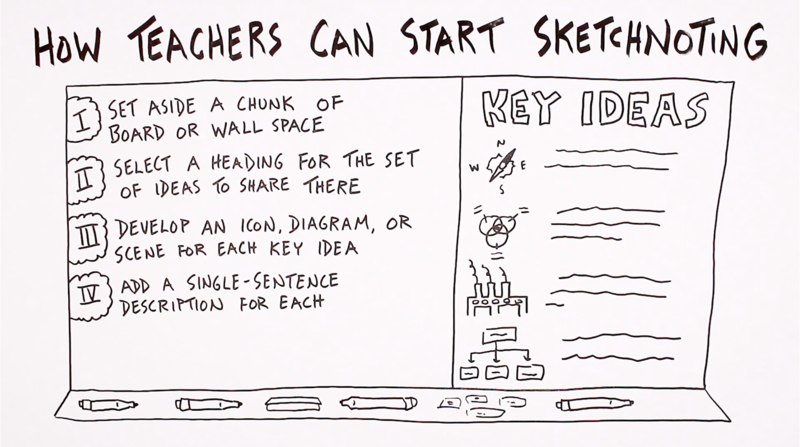 More tools to help you weave sketchnoting into your classroom within this toolkit. That kit includes many short video lessons and practice activities that are designed to be used in your classroom, right before you jump into the content for that day. You can learn more about that resource kit here. Good luck as you try out these ideas in your classroom. I hope that you enjoy their instructional value and that your students see how the tools of visual note-taking might play a positive role in their current and future academic pursuits.